Survival-Warehouse has created this high quality Mountain House 6 month survival food kit. 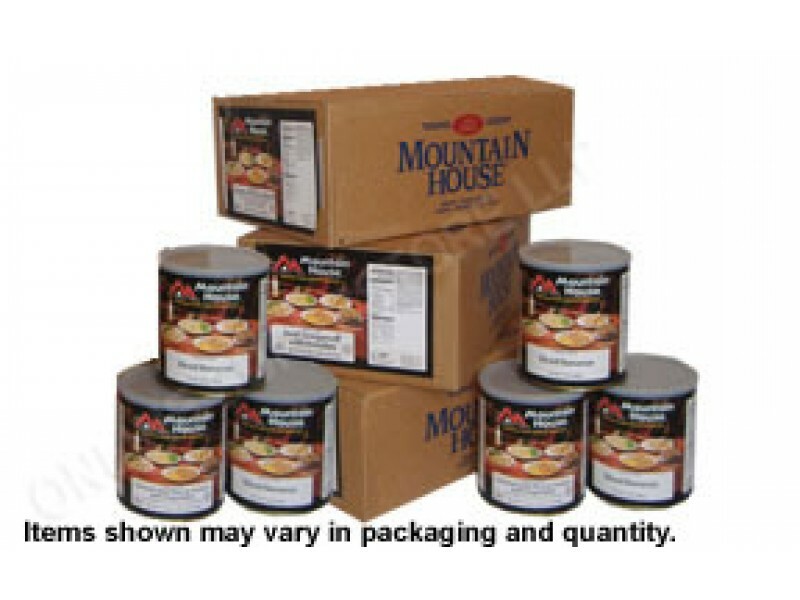 This Mountain House freeze dried survival food kit comes in long term storable #10 cans. This 6 month survival food kit will provide you with two great tasting freeze dried meals per day. The survival food included in this six month survival food kit is extremely diverse, so you won’t get stuck eating the same things every day. You’ll enjoy scrambled eggs with ham & peppers, scrambled eggs with bacon, butter flavored egg mix, granola with blueberries & milk, spaghetti with meat sauce, chicken ala king, beef stroganoff, lasagna with meat sauce, rice & chicken, vegetable stew with beef, chili mac with beef, noodles & chicken, chicken stew and New Orleans rice with shrimp and ham. When it comes to creating a survival food stockpile, you really won’t find a better selection for a more affordable price. Best of all we offer Free Shipping in the lower 48 states. NOTE: Mountain House items may be substituted with similar Mountain House items of equal or greater value due to availability.